You no doubt value having your windows in your room that allow in stimulating natural light during the daytime while also allowing you to see to your view outside, but what you probably don’t like is the light that leaks inside while you are trying to sleep. While our society today is full of artificial lighting, it was only a few generations ago that artificial lighting was non-existent. This means that our ancestors slept in complete darkness, which was beneficial for falling asleep at night. Our circadian rhythm is the natural cycle that our brains use to regulate when we feel alert versus when we feel ready to sleep, and it primarily relies on our exposure to light. Despite the fact that most window treatments block a significant amount of light in your room, falling asleep quickly and getting a full night’s sleep is best achieved in total darkness since that is what triggers our brains to feel ready for sleep. Hunter Douglas offers great options for blackout shades that can darken your room to help you fall asleep fast and sleep more soundly. Come to Blind Builders for help with choosing blackout shades for homes. Hunter Douglas shades are available with two different types of liners that can allow you shades to block light from entering your bedroom. Attached liners are available on shades such as the Designer Roller Shades, a stylish and easy to use roller shade that is precisely measured to your windows to provide the smallest light gap possible. The liner effectively turns these fashionable shades into blackout shades by preventing any light from leaking through the material. The extra thickness also helps to dampen sounds from outside, creating even more of a perfect room for falling asleep. The Duolite® independent liner is ideal for creating flexible light control in your home. This system is available on multiple types of Hunter Douglas shades and pairs especially well with the Vignette® Modern Roman Shades, a sleek and uncluttered rendition of the classic Roman shade design. The Duolite® independent liner lowers behind your shades separately from the rest of your shades while rolling down from the same headrail, keeping your shades looking sleek while giving you two opacities in one shade. The Duette® Honeycomb Shades are a great option for additional energy-efficiency in your home and added comfort and style. These shade are also available with the innovative LightLock™ feature, the first available feature of its kind that results in absolute darkness in your bedroom. 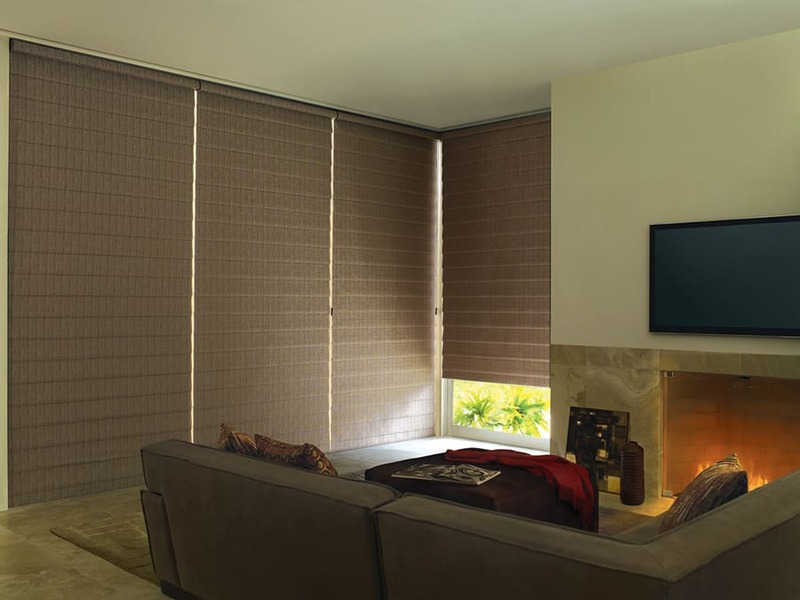 The system works by using channels of micro-ridges that overlap the front and back of the shades on either side. These channels block any and all light from leaking through for a completely dark room perfect for sleeping. The shape of these cellular shades also dampens sounds from the inside and outside for a calming environment. At Blind Builders, we want to help enhance your home style while also helping you sleep better at night, which is why we offer blackout shades from Hunter Douglas. We are located in Feasterville, PA and offer services to Bucks County and Montgomery County, including Newtown, Yardley, Doylestown, and Warrington, PA. We hope to see you soon so we can help you sleep more peacefully.